During the hot summer months, the cool season grasses tend to slow down their growth. They do not like hot weather. If the temperature goes up into the high 20’s (90’s in Fahrenheit) you will notice a reduction in clippings removed from mowing. During this period it is very important to keep the length of the grass high to aid the grasses water retention. It is also important to keep the grass fed with a balanced fertiliser. During July and August your grass still requires a fertiliser that contains a balanced percentage of Nitrogen (N), Phosphorus (P) and Potassium (K) to keep the plant healthy throughout. The third regular treatment of the season is a carefully selected granular, non-scorch, slow release fertiliser. This gently feeds your lawn during the summer. However, occasionally it can get very hot and dry during this period in which case a granular fertiliser may not be appropriate. If this happens, I either switch to a liquid fertiliser, or delay the treatment until rain is forecast. I also spot-apply a full-spectrum liquid herbicide, just to tidy up any remaining fast-growing annual weeds that may have appeared since the previous treatment. Promotes a healthy grass plant throughout. Improves the colour of the grass. 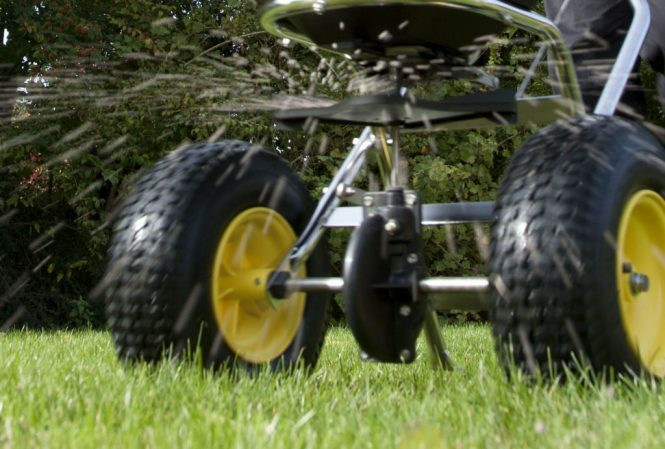 Improves the thickness of the grass sward. Helps it through tough hot weather. There is a risk of burning lawns at this time of year, so extra care must be taken to keep your lawn well watered. The third fertilisation and weed control treatment of the year is applied in July or August. However, the exact time will depend on the local weather conditions and the date of the previous treatments. Treatment 3 can be applied in a variety of weather conditions, although caution should be taken during times of very hot weather. There is no preparation needed before treatment 3 can be applied. I do recommend not applying the treatment within 3 days of mowing. I will contact you before the treatment to work within your mowing schedule. None of the regular fertilisation and weed kill treatments produce any waste that the customer needs to dispose of. If a spot-herbicide has been applied with this treatment, then I recommend staying off the lawn for a couple of hours, until it is dry. If the weather is hot, then your lawn will benefit from regular irrigation to help use the feed most effectively. If a herbicide has been applied with this treatment, then I recommend staying off the lawn for a couple of hours, until it is dry. If the weather is hot or dry, then your lawn will benefit from regular irrigation after this treatment. Depending on the weather trend that year, there are a couple of beneficial additional treatments which can compliment your third regular treatment. Solid tine aeration is an excellent maintenance aeration treatment to apply. It keeps lawns open and allows moisture to penetrate to the roots. If it is a warm summer, this is an excellent treatment to add to your lawn care regime. If the weather is very hot or in a drought phase, a water conservation treatment is an excellent additional treatment. It helps your soil keep hold of moisture and prevents dry patch in a lawn. A seaweed biostimulant is also a great treatment to apply in summer. It keeps trace nutrients topped up and prevents the lawn from becoming stressed. Question: Overseeding and feeding a lawn?